In 1812, Napoleon invaded Russia. He marched in with 700,000 men, expecting a glorious war. But the Russians did something odd. They retreated and burned their villages and crops as they went. 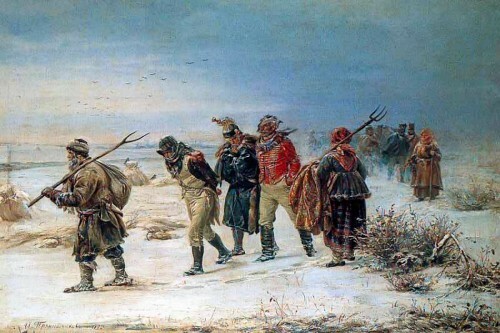 Napoleon chased them deeper and deeper into Russia, eventually reaching Moscow, which was curiously deserted. He suddenly realized that his troops were stranded in a harsh Russian winter with no food. With no other choice, he turned back toward Europe. The journey out of Russia was horrific. When Napoleon stumbled back into France two months later, he had less than 30,000 soldiers still able to fight. In the 200 years since, this has become known as a textbook failure of logistics, which is the science of moving and supporting people and materials. Napoleon couldn’t win the war because he couldn’t even solve the logistical problem. Clearly, in order to fight a war, you have to get to the war. Additionally, you have to support your troops in the field — vehicles need fuel, soldiers need food, guns need ammunition. While logistics isn’t the most glamorous discipline, it’s clear that the first battle of any war is logistical. If you fail the first battle, then you can’t win the war. You can’t even fight it. The same is true of fitness. In order to win the war, we have to get to a place where we’re willing and able to fight it. We confuse the first and second battles of fitness all the time. The first battle gets you to the gym (or to the running trail or to your yoga mat in front of the TV – whatever). The second battle is what you do when you get there. Yet so much attention gets paid to that second battle. It’s more glamorous, clearly. Who doesn’t want to spend their time trying to perfect their squat stance? But so many people lose the first battle that the second battle often never gets fought. For every person in the gym working on their squat, there are 10 people who never even got to the gym in the first place. And no matter how awesome that WOD was, there may be someone who’ll fist bump you on the way out the door, and then never come back. CrossFit can be clique-ish sometimes, and this doesn’t help. There’s such an emphasis on performance that more attention gets paid to the high performers – you’re never going to see a triumphant Facebook video of a guy snatching 65 pounds, and no one at CrossFit HQ is going to talk about how hard it is for the average CrossFitter to stay motivated. Instead, we play along with the fiction that everyone is always ready and eager to throw down, every minute of every day. This skews our perspective on that first battle. We tend to compare ourselves to the elite. We assume they’ve won that battle decisively and never have to fight their way into the gym in the morning. They breathe rarefied air where there are no battles of motivation. And how great would that be? Weirdly, we take comfort in this. We secretly like the idea that some people don’t have to fight that battle, even if we still do. We like this because we don’t like the idea that there’s even a battle to be fought. We’d rather pretend that consistency can be automatic. We hope that there’s a world where we don’t have to second guess the snooze button every morning or fight the urge to drive home to Netflix after work rather than going to the gym. You’ve been there, and you know it. Any one of us could lose that battle at any time. You might think you’ve reached a point where you’re unstoppable, but the right combination of circumstances at the wrong time could over-run you at any moment. Any given workout could be your last. In the last year, about 25 established members of CrossFit Sioux Falls stopped coming. Some of them moved away. Some of them found somewhere else to workout. But there’s a subset of that group that just gave up one day and lost that first battle. For some reason, they couldn’t fight it anymore. They raised the white flag and they surrendered. Why is that? Sometime after that last workout, something happened to derail the next one. What was that thing? For many, they don’t even know. The reasons are emotional, beyond their immediate understanding. I’m convinced that we proactively think our way into the gym, but we subconsciously emote our way out of it. Lurking somewhere on the outskirts of our rational thoughts are things which carry our motivation off into the night. They disguise themselves as circumstances or obstacles, but the effect is the same. One day, for whatever reason, we lose that first battle. We can’t keep up the fight. But we don’t like to talk about emotions. We control our thinking, but our emotions control us. They’re forces we don’t quite understand which might come from painful situations in our past that we’d rather not think about. While rational thought represents strength and initiative, emotions represent weakness and control. I wish I could tell you these examples are made up, but they’re actually my own. Perhaps you saw yourself in a couple of them, or maybe, if you’re honest with yourself for a moment, you can add to the list. We all have something we have to fight to get started and stay moving. Tolstoy was saying that there are multiple obstacles to be surmounted to have a happy family. Happy families solve them all, where unhappy families can fail at one or more of them in a spectacular number of combinations. This has become known as the Anna Karenina Principle, which broadly implies that there are far more ways to fail at something than to succeed. There are so many forces in that first battle trying to keep us out of the gym. The only way to be successful is to win at them all. But, before this all gets too depressing, perhaps we can take some solace in the fact that we all fight that first battle, whether or not we ever talk about it. At some level, we’re all walking wounded. Look around next time you’re in the gym and understand that there are people there for whom it wasn’t automatic. They may smile and pretend otherwise, but just walking through the door was a push back against resistance. They won that first battle. This time. I can’t make the battle go away, but I can tell you that you’re not alone. And I can tell you that the battle is fought and won dozens of times every day by the people you see during warmups. If you fight this, don’t feel like you’re somehow different or deficient. This stuff is hard. If you know someone that can’t seem to win that first battle, send them this blog post. Let them know that people who once thought it was hopeless somehow manage to fight that battle and win it. They can too. A new Intro to CrossFit class is starting soon. Contact Liza at liza@crossfitsiouxfalls.com for more information. Thank you for so eloquently writing about this subject. Consistency is the first and most important variable for success. No one ever accomplished anything if they didn’t show up! I used to teach Personal Development at a university and advise students to be careful when giving/receiving canned advice. People would often quote things like ‘You’ve won half the battle by showing up’ without understanding what it really meant, and I think that this article sums it up perfectly. ‘Logistics’. Thank you for this. This was, for me, an incredibly profound and timely article. Thank you, and please keep writing!